Fall is the coziest time of year with pumpkin-spiced treats and golden fall leaves which is reflected in our Pumpkin Harvest Centerpiece. From cozying up with a cup of freshly pressed cider to enjoying the great outdoors on a hayride, fall is wonderful time of year as we ring in sweater weather, pumpkin spice anything, and warm colors. In addition to the wonderful changes in color and weather, fall also provides us with new textures and seasonal flowers which is, for us, perhaps the most exciting part of this seasonal transition. In anticipation of fall, we’ve seized the opportunity for change and are excited to unveil our new arrangements and wreaths in our fall catalog, arriving in homes within the next few days. 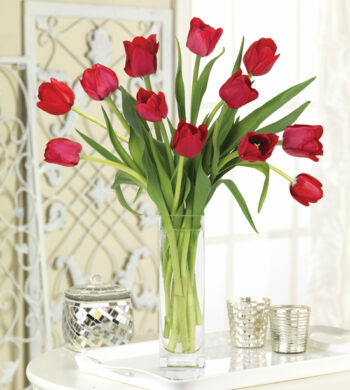 In it, you will find flowers that celebrate autumn, from lush, colorful bouquets to more structured wreaths and centerpieces highlighting non-floral fall elements such as feathers and fruit. Mums of any sort are a quintessential fall flower that is as diverse as the season itself. Arriving in various colors, shapes, and sizes, mums work beautifully in any bouquet or arrangement. While the larger and more dramatic Chrysanthemum may be the most well-known mum, there are several types such as the button mum or mini Yoko Ono mum that differ in size and texture as well as make great additions to fall bouquets. 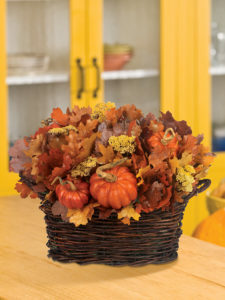 Several of our Fall bouquets contain the versatile mum to add depth and interest. 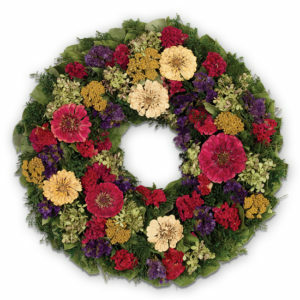 Our Bold Zinnia Wreath features bright azaleas with other fall fillers like yarrow for an elegant attention-grabber. Sunflowers are particularly bright and begin their season in summer, making them the perfect flower to transition into fall. 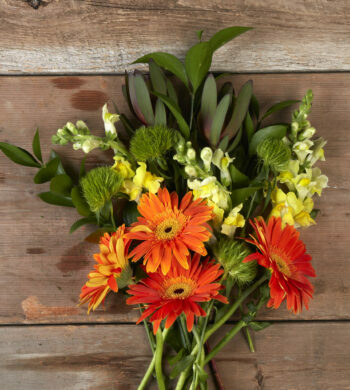 From our popular Exotic Sunset Bouquet with its summery feel to the more fall-like Pumpkin Sunflowers in an autumnal ceramic pumpkin vase, sunflowers are a perfectly perky way to celebrate the season. Countering the darker tones of fall, are lively zinnias that come in a dazzling array of colors. Zinnias are related to the sunflower tribe of the daisy family, so it’s no wonder that zinnia flowers are eye-catching and easy to spot. True to form for this brilliant bud, our Bold Zinnia Wreath features radiantly colored zinnia flowers on a twig base for an attention-stealing fall wreath that falls in line with seasonal tones and elegance. 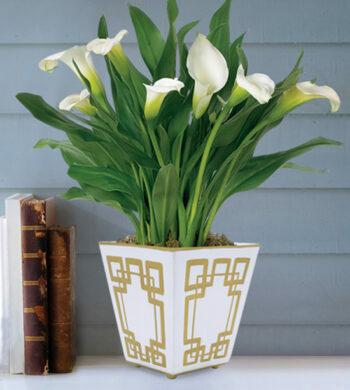 A classic flower, lilies have a curved body and an open blossom that works to give structure and a distinct look to any arrangement that it is a part of. Many of our new bouquets for fall feature colorful Asiatic lilies for this very reason. 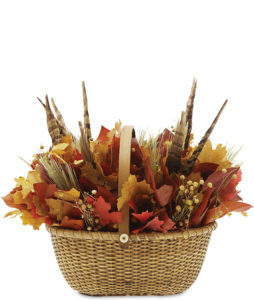 An unconventional yet celebratory arrangement, our Walk in the Woods centerpiece contains natural fall elements such as pheasant features and natural maple leaves. Berries are a seasonal bouquet filler that add roundness, texture, and shape to a bouquet while adding festive notes reminiscent of a fall harvest meal. These types of berries are prevalent during this season, and look lovely as an accent to anything from large, seasonal bouquets to starker, more structured wreaths. If you’re ready for the darker shades of cooler weather, preserved wreaths are a favorite with natural elements like feathers, pinecones, grasses and berries. These seasonal additions lend a unique touch to an otherwise traditional bouquet or wreath. 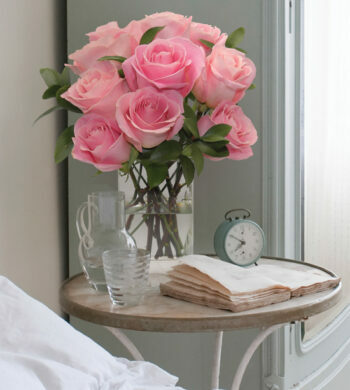 Send something fresh like a fall flower arrangement as a beautiful gesture, or find a wreath or centerpiece to gather attention to the table at a fall feast. Another attention-grabber is the exciting news that we’ll be dropping into your inbox soon, so be sure to keep an eye out. If you haven’t signed up for your opportunity to receive Luxury Rewards, it’s not too late – make sure to join to stay up to date and stay in the know on special offers, discounts, and more. Either way, be sure to take a look at all of our bouquets, preserved wreaths and gardens to find the right one for you to ring in the new season!